laura doodles: Inspiration Post: Tasteful Teacups!! Hey everyone!! I know it's a little LATE but I still pulled together a theme of favorite creative pieces to showcase in this month's "Inspiration Post." If you're unfamiliar with the blog, the "Inspiration Post," shows off some crazy imaginative creations that all have one general theme. The theme is personally picked out by me and June's muse of the month was "Tasteful Teacups!!" Welcome to the tea party!! Being that I am a girl, I did go through a tea party phase with lots of mis-matched little cups filled with "tea" (water) that I would serve to my stuffed animal friends. My imagination has only grown since then and I've come across so many unique teacups and saucers I can't help but continued to be inspired. Whether you prefer handle or no handle, grab yourself a mini cup and scroll down (pinky out) through my collection of tea cup pieces!! This piece of furniture is practically viral. I've seen it on a few different websites and blogs and it was even lusted after by recording artist Kerli. 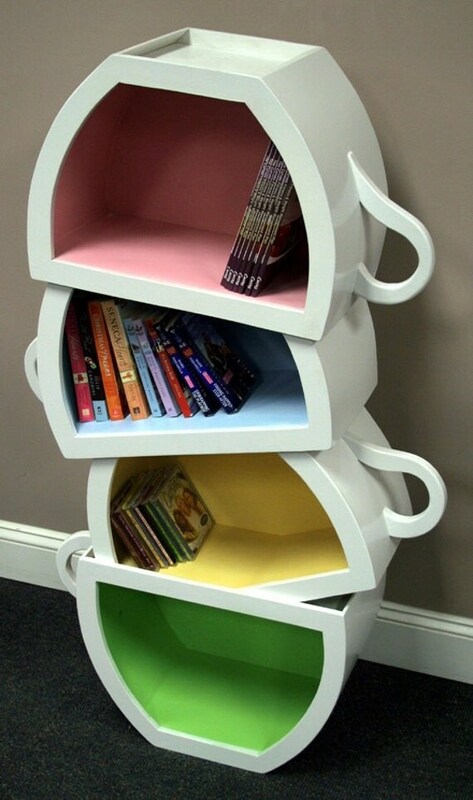 A real work of imagination meets functional furniture, this 1 piece bookshelf gives the illusion of a set of 4 teacups unsteadily towering on top of each other. The original design was created by design engineer Scott Blackwell whose Etsy shop is currently on hiatus due to catch up on the demand for his crazy creations. Why stop at a simple tea cup when you can have an entire tea party on just one ring?? 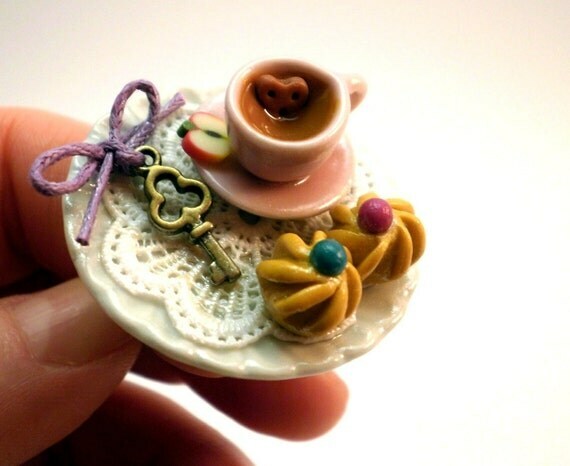 Handmade and on the tiniest of scale, this ring features a half empty tea cup complete with biscuit for dunking. It's sophisticated, dainty and much more traditional than the other takes on teacup pieces in this month's post but definitely worthy to include!! View the detailed listing and other fun jewelry pieces in Bijotti&Ciciotti's Etsy shop!! 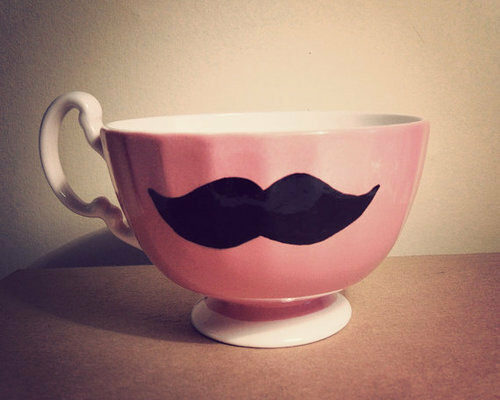 Check out this twist on your typical porcelain tea cup!! An ornate heirloom fancy enough for any tea party, this completely original piece is only a fraction of the bizarre creativity that is the "Blaue Blume Tea Service," collection. A prime example of re-imagining a simple subject matter, the contrast between conventional and elegantly odd make this tea cup special!! All pieces are designed by Tina Tsang and available to purchase on the Undergrowth Designs website. I'm not entirely sure of the origin of this piece but the concept was too fun to pass up. 12 different tea cups form one amusingly chic timepiece. I'm PRETTY interested in re-creating this sometime as a DIY gift. Supplies? Pick up 12 random tea cups that you fancy at a thrift store, purchase a set of clock hands at a craft store, SUPER strong glue and add a piece of wood to hold it all and VIOLA! Our final inspiration piece for June 2013! I didn't intentionally grabbed 60% of this month's post off Etsy. I couldn't help myself!! Everyone on there is just so darn creative. I always have a tough time deciding on what pieces to feature so there's always bonus "Tasteful Teacups" over on the Pinterest board I dedicated to "Inspiration." Follow http://pinterest.com/nerdycupcakes/inspirations/ for sneak peak's at next month's picks and more!! Have a great week everyone! !